Jammer's Blog » Live. Dance. Die. Repeat. At the center of the very Trekkian time-loop plot of “Magic That Can Make the Sanest Man Go Mad” is an intimate character story about pesky human emotions and what they mean to a character who was raised the Vulcan way. 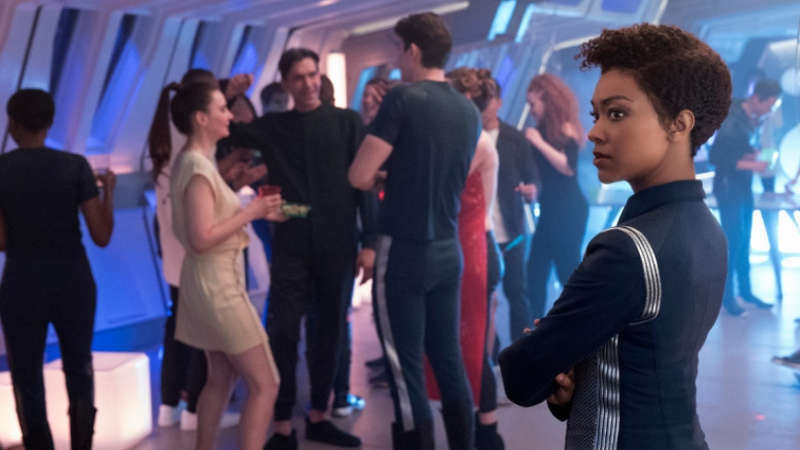 Michael Burnham has never been in love, and she has never admitted this fact to anyone — which is particularly notable in that she feels she needs to keep it a secret at all, as if it’s something that brings her embarrassment or shame. That’s an intriguing personal wrinkle to a character with a Vulcan facade who struggles with inner emotional questions. (Indeed, I have often wondered in general how Vulcans process the feelings of “love” alongside their logical imperatives and their general — although not absolute — claim to eschew emotions. Clearly it falls somewhere on a range, but how does that work?) That these character beats play directly into the plot — where time is repeating Groundhog Day-style and our heroes must figure out a way to escape — is commendable.